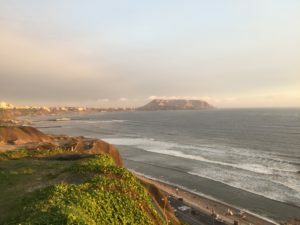 I arrived in Lima about one week ago. I was literally shocked by the culture immediately when I got off of the airplane. 7 hours on a plane and I’m surrounded by a city slightly bigger than NYC in population, that speaks almost exclusively another language, which I know not-that-much about. It was chaos, the whole place is chaos. But somehow, it works. The first thing I noticed which didn’t make sense I understand are referred to as combis. Also known as microbuses. They are glorified minivans that race around Lima picking up passengers for 1 sole (about 30 cents) or less. When I say racing, I literally mean they are racing. The doors to the van are frequently open when they’re driving down the road, there’s someone leaning out into traffic yelling which stops they’re making, and passengers are running to catch up to them so that they can get on. They often start going before the passengers are fully in the van. They’re packed, they’re hot, and they’re frenzied. They frequently get in accidents. But again, somehow they work. 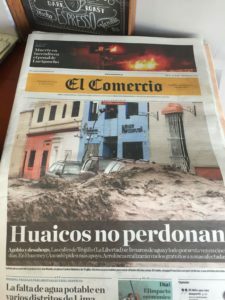 Also on the day I arrived most of the country was hit by a bunch of huaicos, which loosely translated means something like mud avalanche. It rains a lot in Peru, and when there’s too much rain large parts of the country can get hit with avalanches of mud and rocks which will destroy roads, buildings, etc. and cause major floods in the surrounding areas. Where I was supposed to be going my first week, a surf down named Huanchaco which is near Trujillo, about 8 hours north by bus from Lima, is pictured in the newspaper here with the caption “Huaicos don’t forgive”. Though Lima was not directly affected by the huaicos, we were stuck without water for about 2 days. Having just left the Northeast of the US where there was snow on the ground, I was not used to the heat here and wanted nothing more than a nice shower. Alas, I had to wait a couple of days for that. So now, the surf school where I was supposed to be working is half under water and I’m not entirely sure if I’m going to be able to go there. But it’s all good, I’m looking for other places to go as we speak, and worst case scenario I’m definitely enjoying myself here in Lima. Speaking of, things are not all bad here! In fact, it’s amazingly gorgeous here in Miraflores, the part of Lima where my hostel is located. It’s about a 5 minute walk away from what I refer to as “the cliffs”, though I’m not completely sure what they’re really called. Basically, there are huge cliffs on the coast of Lima which drop down to a highway which rides along the ocean, and the ocean itself. The cliffs are beautiful, green knolls which overlook the ocean and are clustered with beautiful art and trees. This picture kind of captures all of the parts. This beach path continues for miles. I’ve spent at least one of my days just exploring this path! The scenery is pretty amazing. If you walk far enough there’s also a mall called Larcomar which is more or less a typical mall but it’s built into the cliffs which makes it a bit more beautiful. So despite the natural disasters, everything’s been pretty nice here. I’m taking my time figuring the next leg of the journey, though it looks as though it will not be in Huanchaco like I had originally planned. I’m not worried about it though, Lima is amazing on it’s own.